(Nanowerk News) A Virginia Commonwealth University professor has received a five-year, $505,000 award from the National Science Foundation to make lithium-ion batteries — which power electric vehicles and portable electronic devices — far more efficient, sustainable and environmentally friendly. 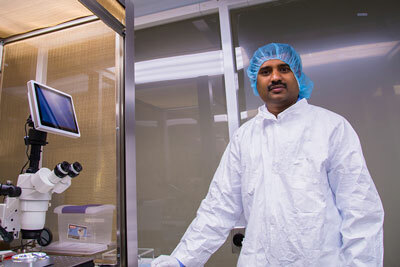 Arunkumar Subramanian, Ph.D., an assistant professor in the Department of Mechanical and Nuclear Engineering in the School of Engineering, will use the grant to deliver technological advances that reduce the cost and carbon footprint of Li-ion batteries by extending their lifespan. He will simultaneously research alternative battery materials that are both nontoxic and more abundant. "If you look at electrical energy storage solutions that are used in today's electric vehicles and portable electronic devices, you would find that lithium-ion batteries is the technology of choice," Subramanian said. "But if you want to make this technology truly sustainable and environmentally benign, then we need to be able to reduce its cost, as well as its carbon footprint as compared to energy derived from other sources such as fossil fuels." Subramanian plans to address these goals by extending the lifespan of Li-ion batteries made from sustainable electrode materials, which are derived from the nontoxic manganese oxide material system. "This project is likely to result in transformative innovations for the battery industry, which in turn will impact a whole host of consumer devices and cars," said Ram Gupta, Ph.D., a professor and associate dean for research in the School of Engineering. An overarching goal of the project, "Sustainable Solutions for Li-ion Batteries through Cycle-Life Improvements in Nanostructured, 'Green' Cathodes", is to maximize the environmental benefits of electric cars. "Electric vehicles are one alternative for reducing fossil fuel consumption and greenhouse gas production for sustainable transportation needs," according to the project's abstract. "Electric vehicles require rechargeable batteries that balance the electrical energy storage and power delivery needs, and these batteries must have a lifespan sufficient to reduce cost and achieve true carbon footprint reduction. Furthermore, batteries should be manufactured from sustainable materials to minimize environmental impact." The award is from National Science Foundation's Faculty Early Career Development (CAREER) Program, which provides the foundation's most prestigious awards in support of junior faculty who exemplify the role of teacher-scholars through outstanding research, excellent education and the integration of education and research within the context of the mission of their organizations. A key aspect of Subramanian's project will be to create batteries in which the team will isolate a single manganese oxide nanowire as the battery's functional electrode element. These nanowire materials are synthesized and supplied by Ekaterina Pomerantseva, Ph.D., a research collaborator and materials science professor at Drexel University. "Now, the reason we want to do this with nanomaterials is because the small form-factors have the potential to facilitate high charge-storage capacities at fast battery charging and discharging rates,” Subramanian said. “The use of a single nanowire battery electrode is motivated by its ability to reveal the electrochemically correlated structure-property-performance relationships in the material system with atomic-to-nanoscale scale resolution, thereby enabling the optimization of the host crystal to lithium intercalation." The "nanowires" are one-dimensional constructs that have a diameter of roughly 10 nanometers to 20 nanometers. These nanowire electrodes will be tested using a co-integrated device created on silicon chips, which includes a lithium cell and a nanoelectromechanical resonator for charge capacity measurements. The functional components of this device are contained within an ultra-small footprint of a square micron, representing the current state-of-the-art for nanosystems made from synthetic constructs. Much of the testing with the devices is being conducted at Nanomaterials Core Characterization Facility, a research core facility of the VCU Office of Research and located in the Institute for Engineering and Medicine. As part of the project, Subramanian's team will also develop a "nano energy" workshop for high school teachers taking part in the NanoFellows Institute organized by the MathScience Innovation Center in Richmond. "We'll have the teachers visit our lab and do hands-on experiments with nano-enabled batteries and then they would take some of these samples for demonstrations in their classrooms during the school year," he said. The researchers will also implement "nanobot" workshops and summer research internship programs, which are focused on the use of nanorobots inside electron microscopes, targeting Summer Regional Governor’s School student participants at the MathScience Innovation Center. The researchers will also introduce this "nano energy" module to high school students taking part in the Richmond Area Program for Minorities in Engineering, a nonprofit organization that works to increase diversity in science and engineering.